Bay Area Pal Tsechen Ling is a nonprofit organization originally started by several families getting together at Berkeley Marina Park to celebrate His Holiness 41st Sakya Trizin’s birthday back in 2007. Our official name, Bay Area Pal Tsechen Ling was given to us by His Holiness in 2010 and since then, we worked with several other nonprofit organizations in Bay Area to attain common goals of promoting and preserving Tibetan Buddhism of Sakya Lineage in our area. We organized several major initiations lead by His Holiness 41st Sakya Trizin in past several years. With growing Tibetan population in Bay Area, we realized that we wanted to form a small dharma community that will promote and sustain Sakya Lineage in our day and age so in late 2015, we elected our first board members and applied for nonprofit organization. Our application was approved for NGO status in 2016. Since then, we have been observing major Sakya Lineage events at various devotees’ house followed by dinner sponsored by host family. To sustain the spiritual values for its members who follow the teachings of Buddha as passed down through the founding masters and lineage of masters in the Sakya order of Tibetan Buddhism. To maintain and promote a traditional cultural heritage based on the Buddhist tenets of harmlessness, altruism, generosity, patience, meditation, and all the wisdom teaching of the Buddha Shakyamuni among its members, and to provide cultural resources to other members of the greater community where there is need and receptivity. Khenpo Sonam Dhondup was born in Qinghai Province in 1977. He first became a monk at the age of 6 at Sakya Gompa Thupten Gemphel Ling receiving Tabjung vows. By 15 years of age he completed the basic monastic ritual studies. When he was 16, he received many teachings, initiations and abhisheka including Druthab Kundo, Phurba, Ketor and Lhorlodemchok and Lama Thupten Chodak. In 2001 Khenpo Sonam Dhondup joined Saklya Thumten Namgal Ling in Puruwala, India and studied higher Buddhist Philosophy until 2007. Then he rendered his services as a teacher in the institute for next two years. After he received Geshe degree, he was appointed as the resident Lama for Purwala Settlement in India to teach Hetuvidya, Pramanavarttika. Since his appointment, he established various programs and supported well being of Purwala settlement. Khenpo Sonam Dhondup la came to America in 2016 and chose San Francisco Bay Area as his resident. 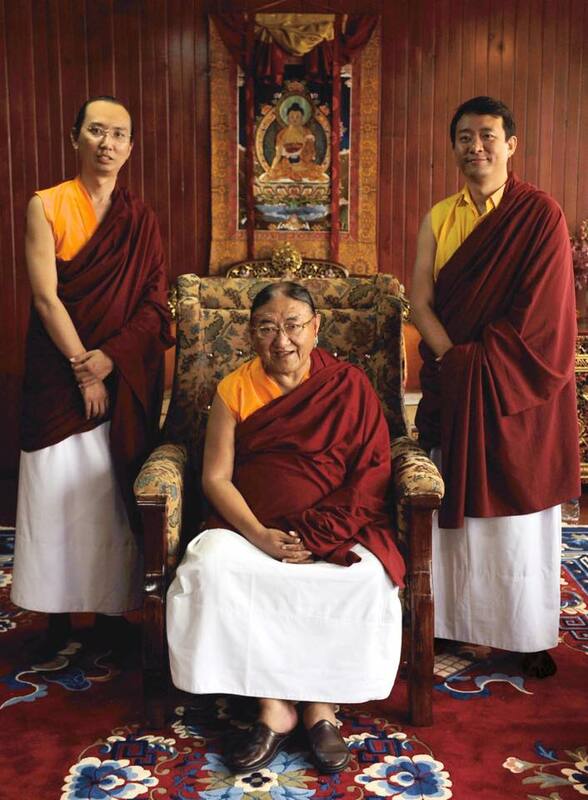 Since then, he supported our mission and Bay Area Pal Tsechen Ling was able to buy a property under its name because of the Khenpo Sonam Dhondup la.